I praise Modoc, and question Jefferson. Ten years ago our family met a cowboy who looked like The Marlboro Man himself, as we stood on a hillside watching him lead a string of horses through the sagebrush and across a creek, with pastel layers of aspens and mountains behind him. 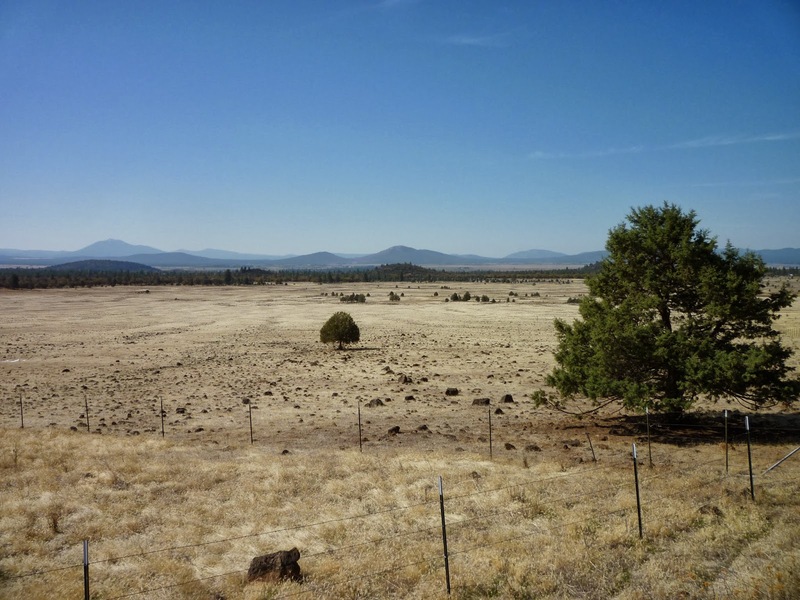 This remote and rugged land is one of the areas that has perpetually been found within the proposed boundaries of The State of Jefferson, a longed-for 51st state that would include several counties in northern California and southern Oregon. 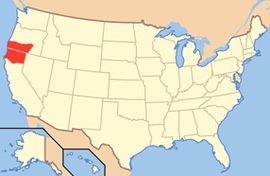 The modern Jefferson includes more counties. 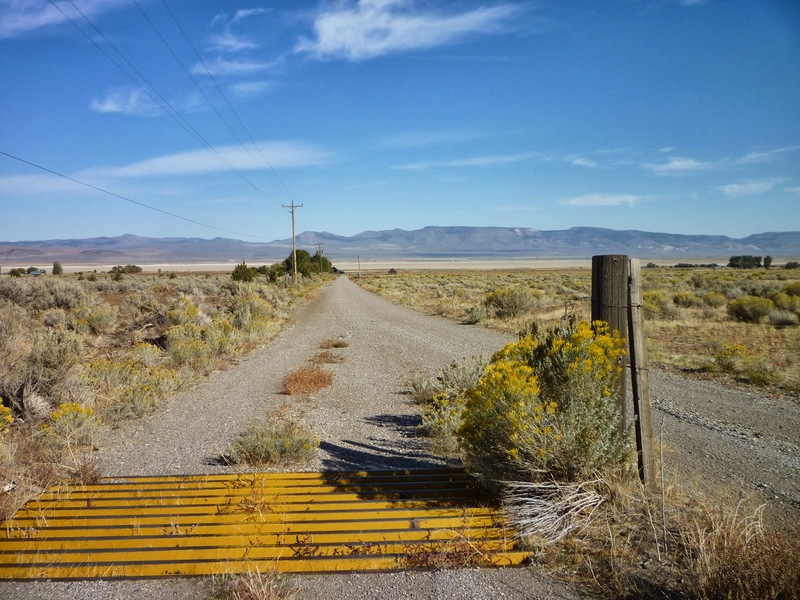 Just last month the supervisors of Modoc and also those of its neighboring Siskiyou County voted to secede from the State of California, as the historic movement revs up again. [Mark Baird, one of the prominent activists] insists the State of Jefferson is the answer to revive logging, protect ranching and lure new businesses. He bristles at suggestions that these counties need to subsist on social services. 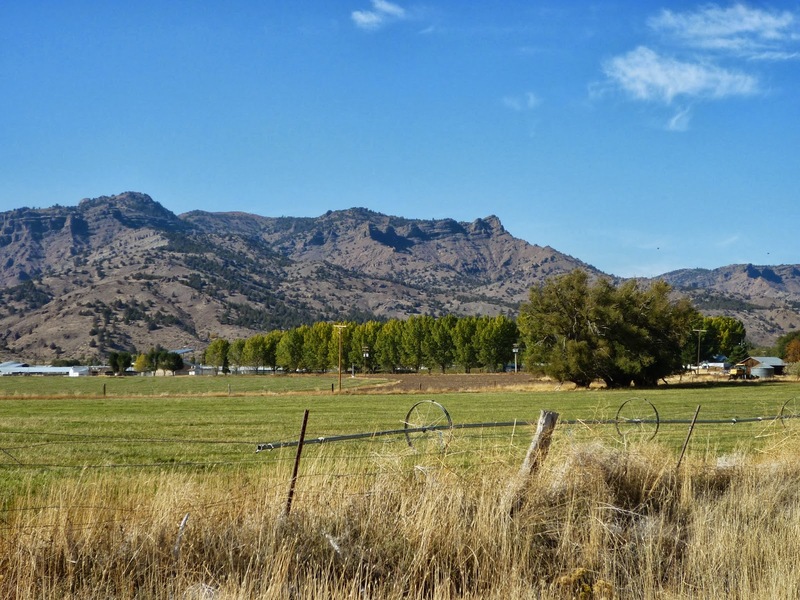 The Modoc county seat is Alturas, a word that means “valley on top of a mountain.” Much of this country is considered High Sage Plateau, with evidently enough water for many cattle ranches and hay fields. 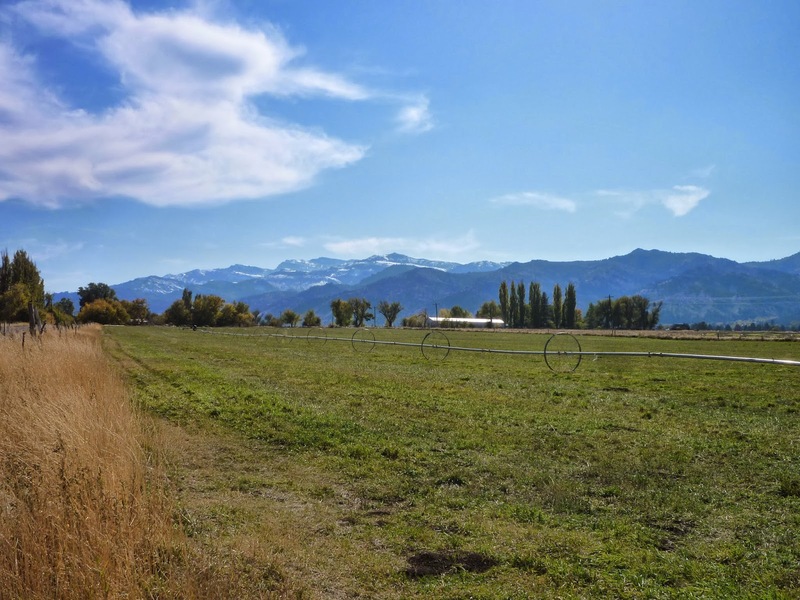 If I hadn’t had a traveling companion to restrict my stoppings, I’d never have made it home for trying and trying again to get the perfect picture of black steers grazing on varying shades of green and yellow-green, with dark mountains behind them. Nothing close to the perfect shot was to be mine. 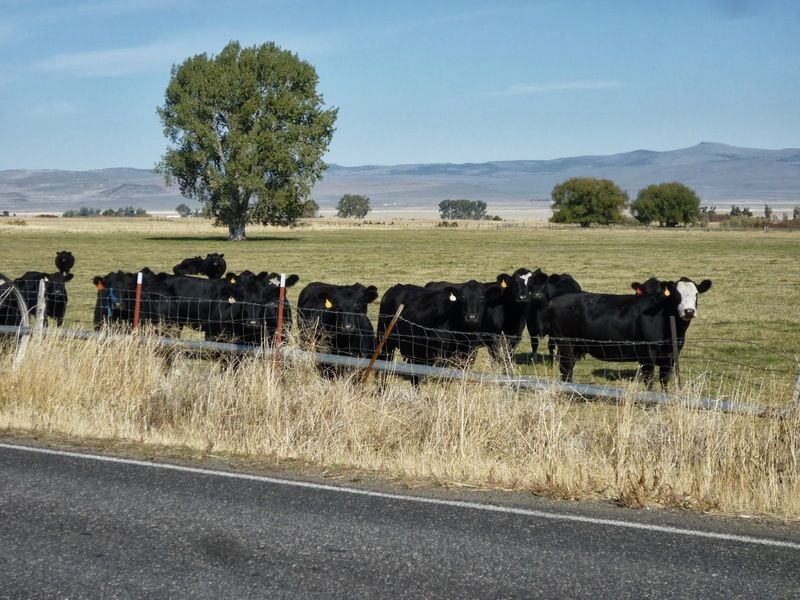 Either I was not high enough above the grassland to get the sweeping view, or the steers clumped up close to see if I were bringing their dinner, or, in the case of those next to our our motel in Alturas, they ran away when I was still 50 yards from the fence. 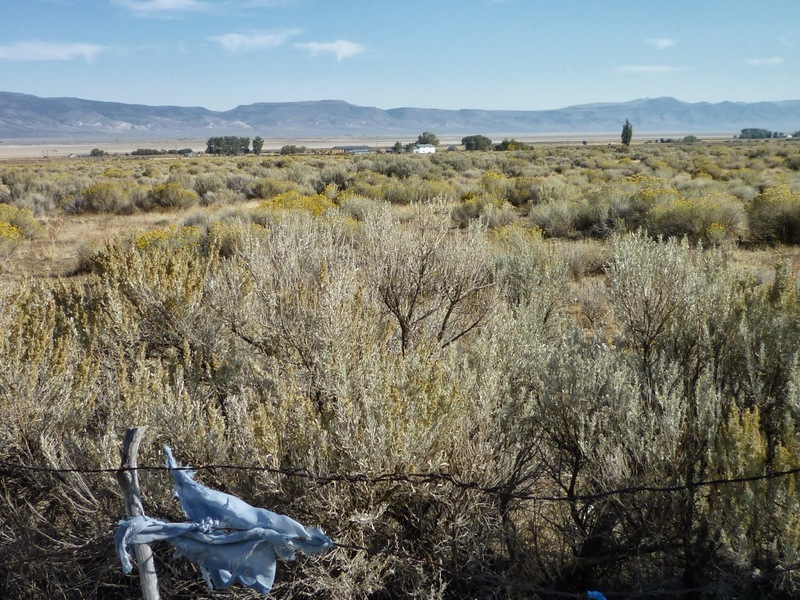 Many of these fine scenes were in Surprise Valley, which is even farther east than Alturas, east of Hwy 395, on the other side of the Warner Mountains. This valley’s elevation, if you drive up and down Surprise Valley Road as we did, is above 4,000 feet. The photo below looks still farther east, toward a band of tan that might be an alkali lake, and up into the Hays Canyon range of mountains that lie mostly in Nevada. 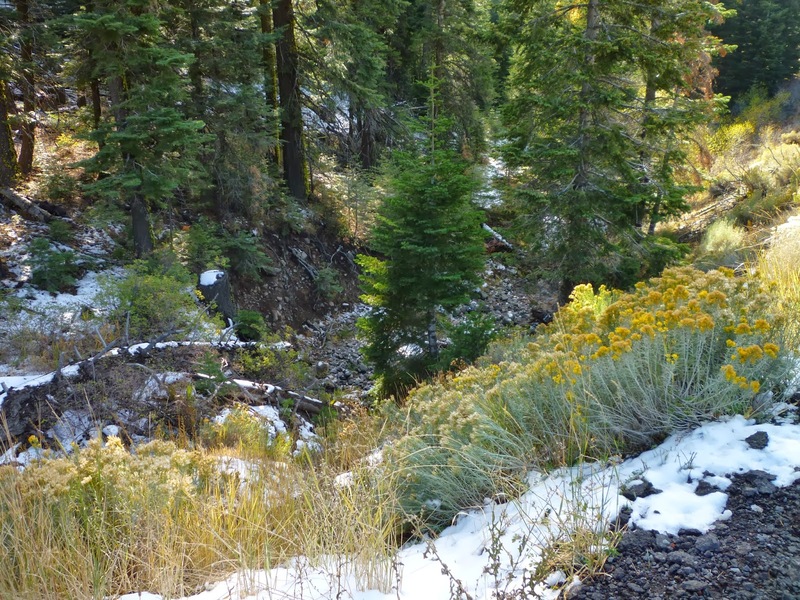 Besides your typical mountains, you can find the Glass Mountain Lava Flow on the western edge of Modoc County, though it lies mostly in Siskiyou County. 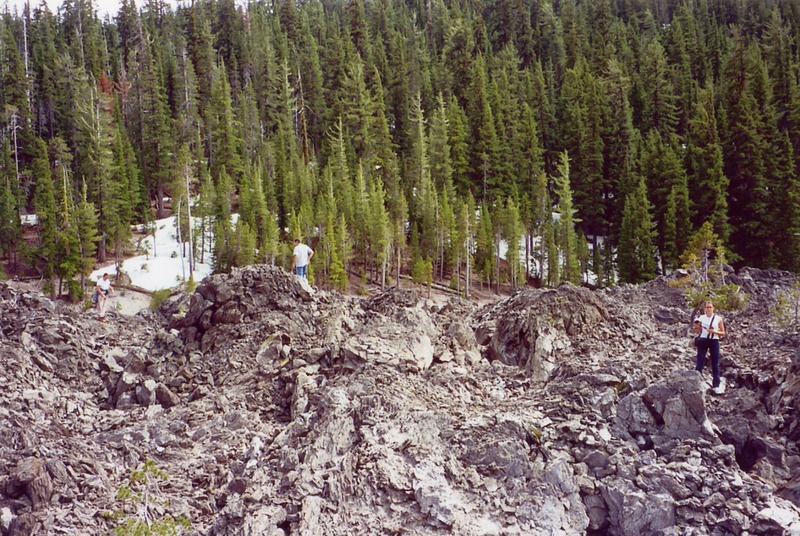 On our previous visit we climbed on parts of that “mountain” and brought home huge pieces of obsidian and pumice. Everyone’s shoes no doubt suffered a month’s worth of wear on that terrain. Glad kids scramble on Glass Mountain. 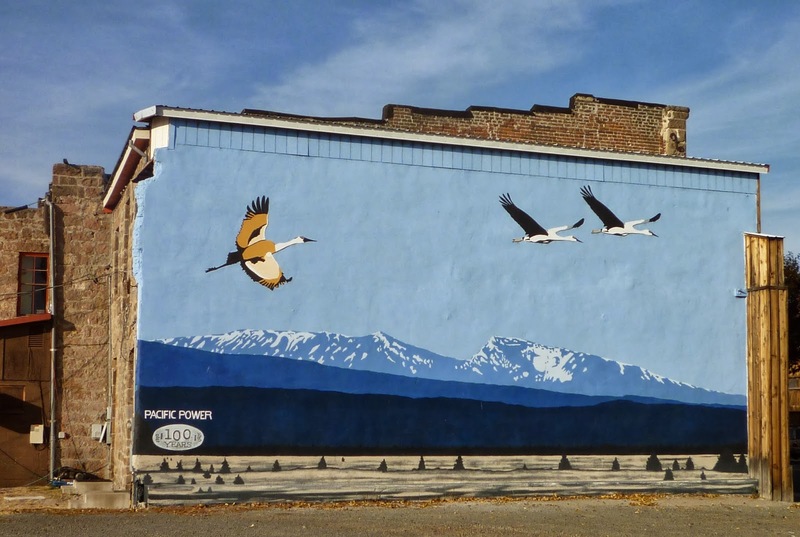 Murals on several buildings in downtown Alturas express aspects of the region that the residents appreciate. 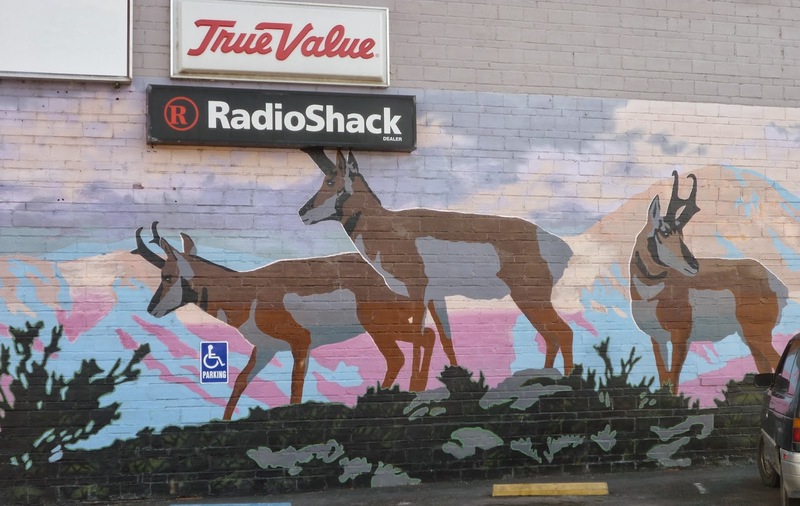 Modoc County has mule deer, herds of wild horses, Rocky Mountain elk, pronghorn, and birds galore. 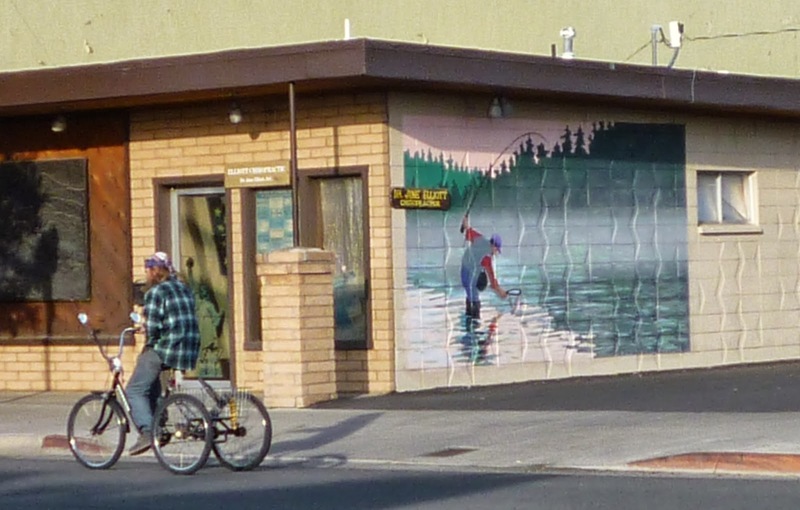 We didn’t make it up to Goose Lake, but the bird mural makes me think of Goose Lake Valley, rich in all kinds of bird life. The painted fowl look as though they could fly right off into the real sky. At the bottom of the mural you can see landscape such as we also noticed on our way up to Alturas, when the rich farmland gives way in places to slopes on which the soil is evidently too rocky and poor to support anything more than the occasional juniper tree. But the existence of fencing makes me think that in the springtime they might run livestock on the greened-up grass. We ate breakfast at the Hotel Niles in Alturas. Nowadays there is a public radio station that claims the name, and people can attend the Jefferson State Hemp Expo, “…founded on the belief that through awareness, education, and the cooperation and coordination of citizens and public officials, many complex social issues can be solved.” Note the emphasis on cooperation, not separation. Separation was formerly the goal of all Jefferson adherents, and a big part of the content of Jefferson as in its nickname “State of Mind.” Currently it does seem that many of the people who use the name don’t really expect anything to come of it. To at least a few it is probably just a brand they use to sell something. At the other end of the spectrum, perhaps, are the hunters and most of the ranchers, and the politically conservative. 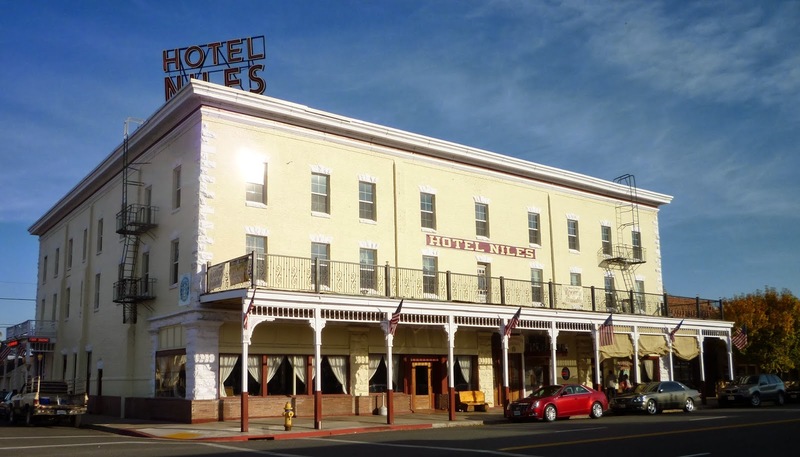 This segment of the populace might include the woman who was noted in the police report column in the Alturas newspaper, which I perused while sitting on the bed in our motel room. She called the sheriff and said that if someone didn’t speedily do something about the dog that was threatening her alpacas, she herself would “dispatch” the dog. I doubt that was the word she used. Maybe the serious secessionists would include the people who shoot at Belding Squirrels during the Annual Squirrel Roundup. These are a type of ground squirrel that looks like a prairie dog, and their large populations damage the cultivated fields (I’m guessing it’s by their holes and tunnels? ), so once a year the residents hold a big fundraiser/pest-control event. The giggling squirrel-shooter in this video I ran across is embarrassing, but you could turn off the sound, try to ignore the squirrels flying into the air, and see some nice footage of Surprise Valley in the background. The Roundup is held in March, so you will see less yellow and brown than in my pictures. If you make it to the very end you’ll be rewarded with a view of Mount Shasta, something that would not be possible from down in Surprise Valley. The moviemaker must have driven back over the pass to the west at the close of day. The likelihood of all these diverse Jefferson people agreeing to secede seems slight to begin with, and that’s not the only challenging aspect of the project. Perhaps the nickname The Mythical State of Jefferson is the most appropriate. Whatever you call it, I do love this country. I had read a blurb about the people who want to secede. It really is pretty up there. I like how you go explore. I had a friend in England send me an Atlas once, In England on the Atlas California is divided with one capitol being in Sacramento and one in L.A. We laughed about it so I guess the thought has been around awhile. It is a beautiful area. Indeed -whatever the residents decide to call themselves, they certainly live in a marvelous, awe-inspiring place! What vistas! Beautiful photos. In the video I loved seeing the wheel system in the background. I grew up playing in an irrigated wheat field behind our house. To the west was an irrigated alfalfa field as well. The water that came from them was freezing cold. Your black steer picture is good too. I have a few black Angus photos from my father's heard a few years back on my computer that I have wanted to post just because they are so pretty. I love your traveling posts because I have never been to California. It is beautiful! I can't blame them and applaud their efforts; what do the folks in Oregon say? The beauty is stunning, Gretchen. Hello there! I am posting a comment because I can't find your email address. 😉 (And because I love your blog.) I have a question for you about education. I need your help to find information supporting the need for young children to play; that overemphasizing the three R's, too much HW, etc. does not actually benefit a child; etc. Do you have leads for me? I found the Peter Gray article on your blog link (“The play deficit”)–any other studies to point me to? Thank you so much!! I love your pictures and historical content! Living in the South, this is news to me, but quite interesting!